Appreciated for its graphic patterns and environmental sustainability, bamboo flooring has become a popular option for homeowners in recent years. Is a bamboo floor the best choice for you? Let's look at the facts behind the trend. 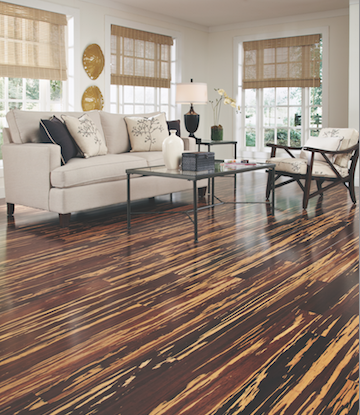 Lumber Liquidators' Morning Star Handscraped Strand Anji Bamboo Flooring. 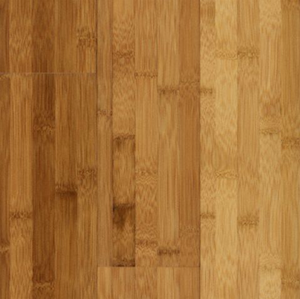 Horizontal-grain, vertical-grain, and strand-woven bamboo flooring are commonly referred to as “solid bamboo,” because they are made up entirely of bamboo strips or fibers. Another option on the market is called “engineered bamboo,” which takes a thin strip of solid bamboo and adheres it to the top of another type of wood such as plywood or fiberboard. The main advantage of engineered bamboo is ease of installation; engineered planks can be floated above a subfloor without need of nails or adhesives, while solid planks are installed much like traditional hardwood. Bellawood Spice Ultra-Strand Bamboo Flooring at Lumber Liquidators. Bamboo flooring is available in a wide range of colors from pale straw to deep mahogany tones and everything in between. Natural bamboo resembles light woods like ash and beech. To create other colors, bamboo can be stained or carbonized, a process that produces pleasing deeper hues. Carbonization, however, is thought to degrade the durability of bamboo floors, so darker colors may not be best for high-traffic areas. The variety of patterns in bamboo flooring is truly one of its biggest draws for homeowners—from the natural silhouettes visible in horizontal-grain planks to the linear quality of vertical-grain planks to the graphic quality of strand-woven designs. Which variety to use in a room of your house will depend on your personal taste and the overall style of the space. 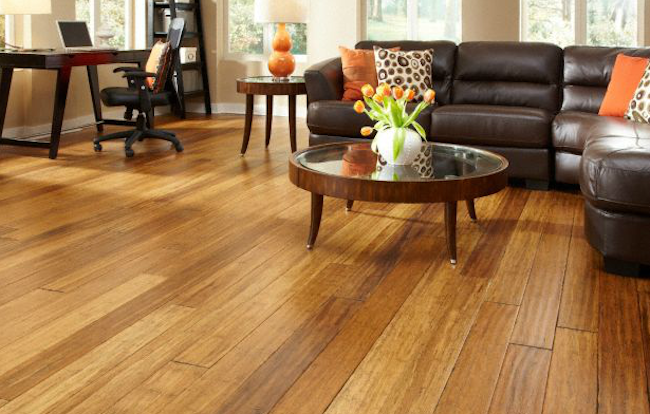 Horizontal Carbonized Supreme Bamboo Flooring from Lumber Liquidators. At about $3 to $8 per square foot, the price of bamboo is comparable to other flooring options such as hardwood, carpeting, or tile. It’s worth paying a little more for a higher-quality product for increased durability. Warranties are often a good indicator of quality; planks with a longer warranty are generally more durable. Households with young children or anyone with respiratory sensitivity will want to inquire about VOC levels before making a purchase, because the chemicals sometimes used in manufacturing can off-gas in the home. For some of the top-rated bamboo floors, click here.